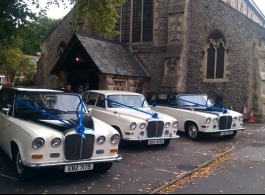 Classic Daimler wedding cars for hire in Portsmouth, Southampton and all of south Hampshire. The classic Daimler Limousine if the perfect chauffeur driven wedding car for Bridesmaids as it has seating capacity for 6 - 7 passengers, there are a choice of these cars available in Black & Ivory or just Ivory. If it is just the Bride and her Father and/or the Groom travelling then there is plenty of room inside the spacious and comfortable rear cabin to accomodate the wedding dress.